This is the view looking west from Capitol Hill in Burnaby. 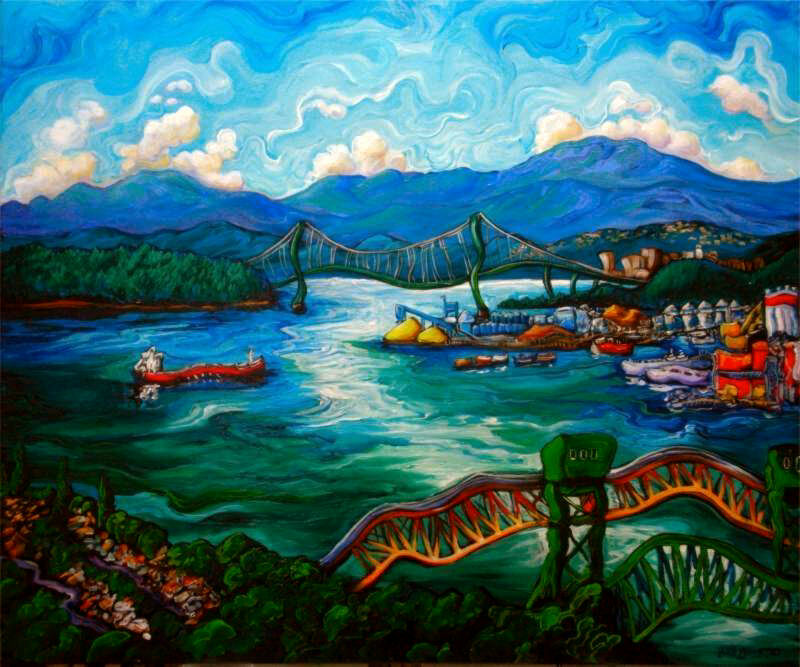 It has characteristic elements of Vancouver which aren’t easily seen from a single vantage point: the industrial buildings and sulphur piles, the sprawl of north shore mountains, the tree-rich tip of Stanley Park, a freighter, a slice of East Vancouver, as well as the Lion’s Gate and Second Narrows bridges. Those two bridges are hard to get in one vantage point. To me they represent two sides of Vancouver: East Van and West Van. On opposite sides of the water, you have the residential neighbourhood facing off against the industrial waterfront. The highlight in the middle plows underneath both bridges towards the layers and layers of mountains. The mountains frame Vancouver and cup it in a constant chalice of motion with the water swirling in the center. To my mind, the things that really make Vancouver “Vancouver” are not its man-made landmarks and bridges but rather their setting of mountains and sea, the predominance of blue and green, and the sense that there are endlessly repeating layers beyond the ones we see in front of us. It’s the optimistic siren-call of the west.